The respiratory rate is counted after taking the pulse rate so that the client is not aware that you are taking it (OER #1). Once you have finished counting the pulse, leave your fingers in place and then begin assessing respiration. Observe the chest or abdomen rise and fall. One respiration includes a full respiratory cycle (including both inspiration and expiration). Thus, the rise and the fall of the abdomen or chest is counted as one full breath. Count for 30 seconds if the rhythm is regular or for a full minute if irregular (OER #1). Report the respiration as breaths per minute, as well as whether breathing is relaxed, silent, and has a regular rhythm. Report whether chest movement is symmetrical. Assess the movement of the chest with adults, and the movement of the abdomen with newborns and infants. Adults are normally thoracic breathers (the chest moves) while infants are normally diaphragmatic breathers (the abdomen moves). Some adults are abdominal breathers. Breathing rates are counted for one minute with infants because the respiratory rhythm (tempo) can vary significantly. For example, the breathing rates of infants can speed up and slow down with some short periods of apnea (pauses in breathing). When assessing respiration, ensure that thick and bulky clothing is removed so you can clearly see the rise and fall of the chest or abdomen. Although respiratory rates are best counted at rest, sometimes this is not possible (e.g., in an emergency situation and with a child who is crying). In this case, document the situation. While assessing respirations, it is important to note signs of respiratory distress, which can include loud breathing, nasal flaring, and intercostal retractions. 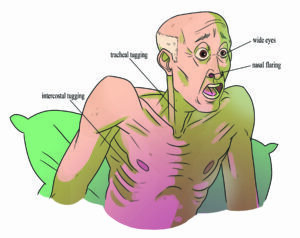 See Figure 3.7 for signs of respiratory distress. These signs require further assessment and intervention. Respiration Technique by Ryerson University is licensed under a Creative Commons Attribution 4.0 International License, except where otherwise noted.